NumXL Software Development Kit (SDK) is a set of files used by developers and their environment to utilize NumXL functionality in their own application. The analytical functions of NumXL are encapsulated in separate dynamic libraries (i.e. DLL), and are published (exported) in simple standard APIs. Those libraries and their dependencies form what is referred to as NumXL Runtime Environment (aka NRE). The SDK is a set of development and runtime wrapper files used by the custom application to invoke the runtime core functionality like ACF,KDE, etc. 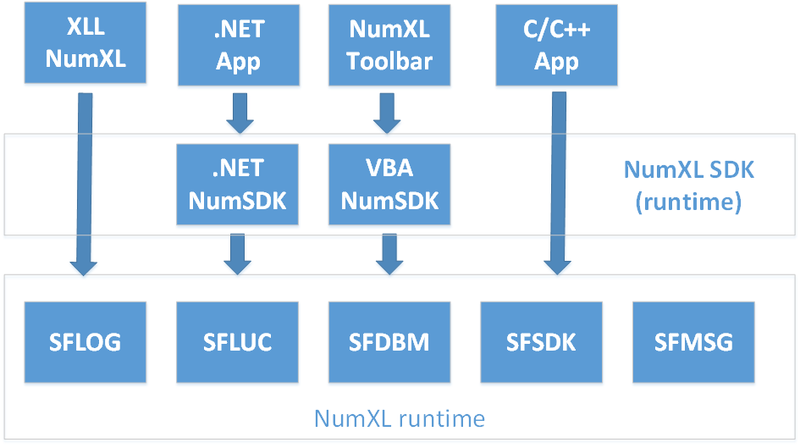 In a sense, NumXL itself can be considered as a custom application for the SDK. Historically, the low-level calculation backend functions of the SDK are fully implemented with (unmanaged or native) C/C++ for performance purposes. Many development environments support calling native API directly, but it is a bit tedious and error prone. To help our users, NumXL SDK comes with various adapters (i.e. wrappers) to further simplify development in different languages. .NET development: C#, VB, etc. The NumXL SDK runs on all versions of Microsoft Windows, and it is available in two versions: 32-bit and 64-bit.